Note to my regular readers: This is no way related to technology or business model, idea or even a blog post. This is an appeal from a stupid common man living in the south side of Indian sub-continent called Kerala, specifically Cochin. For last few days, I have been looking towards high stored buildings. If you know me in person, it’s not me who stare at large buildings often. I usually don’t care height, age and the language you speak and that applies to any object not just human. But why I now began to look for large buildings now days? It has a solid reason behind it. I know for sure it’s the only thing which can save my life tomorrow. 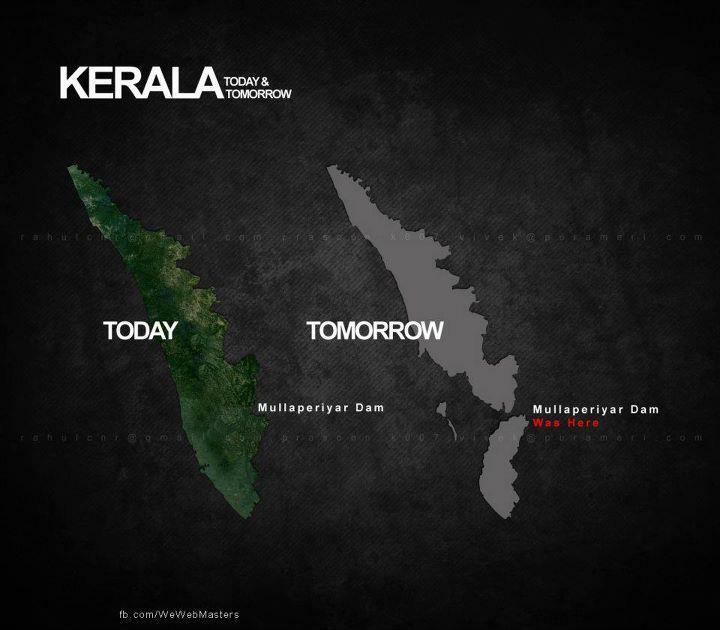 Yes, if the Mullapperiyar Dam collapses tomorrow, I will be one of the 35 lack people who will go underwater. I’m not afraid of dying I know it will happen a day and I always believed myself that mine will be sooner. What I want my readers is to make sure that we know we were gonna die before we actually do. 35 lack people are going to die not because of a natural disaster. But the laziness and ignorance of a major part of us and shattered groups of people who know it’s going to happen and didn’t care. I don’t understand the logic of renting a 50 years lifetime guaranteed dam for 999 years with rent of 30 rupee per acre. And it’s been more than 116’years. Couple of tens of years ago, the agreement was renewed by officers of both Kerala and Tamil Nadu and nobody was known about it in public. You can read more about the issues and the history behind the funny Mullaperiyar dam agreements here. But what I’m Noreen interested is ignoring the history considering it as a story and find a solution. As the case is between two states Kerala and Tamil Nadu things are little complicated here. Only question Kerala has is about life of 35lack people in five districts including Idukki, Ernakulam and Alappuzha. For Tamil Nadu, it’s main source of their revenue in terms of electricity which Tamil Nadu produces from Mullaperiyar which was not agreed in the Dam agreement with Kerala. What Kerala agreed was that the water can be used for serving water supply to seven districts in Tamil Nadu. Solution #1: Build a large parallel Dam within secure distance from current dam and break current one. Flaws: It will take at least ten years to build a similar capacity dam and current dam can’t stay for more than an year as it is now. Keep in mind that yesterday there was fourth miner earthquake of this month. So either Tamil Nadu will have to suffer ten years without less water which may cause major financial lose to the state specially who depends on agriculture. But keeping watter level in low while the other Dam is build will solve 70% of water availability issue. Kerala Govnt even agreed to spend 600 crores for new Dam for sake of people security. Kerala is not using water from Mullaperiyar Dam at present. So with investment of money in, Kerala is expecting to get water benefits. Solution #2: Build more smaller Dams and lower water level of Mullaperiyar and distroy Mullaperiyar securely after all Dams are built. Water can still be used by Tamil Nadu, but they wont be able to make 30,000 crore per year which they are making now by electricity which was not agreed in the initial agreement with Kerala. Tamil Nadu will not agree to such a lose ignoring life of millions of people in Kerala. Solution #3: This is my favorite. The more I grow, Im losing my pride as Indian. Politics, Language barriers and unwanted criticism and overtaking of rules my human is making me nervous these days. I dont find a meaning in being one country with numerous states that fights each other. The Central government system has no power when it comes to warn or act against these states. Corruption is leading the country to its higher levels. So lets talk about the solution. Shuffle the state boundary structure. A lot of people in Idukki District are Tamil speaking people and the range fixing of states in India was not done properly when we got Freedom in 1947. So shuffle state borders in a way that there is no more inter state fights. YES BUDDY ONLY GOD CAN SAVE US….THIS IS THE CLEAR INEFFICIENCY OF BOTH THE GOVERMENT…MAINLY TAMIL NADU…THEY CARE ABT THEIR RESOURCES RATHER THAN INNOCENT LIFE OF PEOPLE AT KERALA….OH LORD PLEASE SAVE US..
Are you a malayali? Who told you that most of the people in Kottayam district are Tamil speaking? Non sense. They are the only malayalees who speaks pure bookish Malayalam. Thanks for correcting me. I was meant to say Idukki, not Kottayam. I parden if the mistake made someone feel bad.